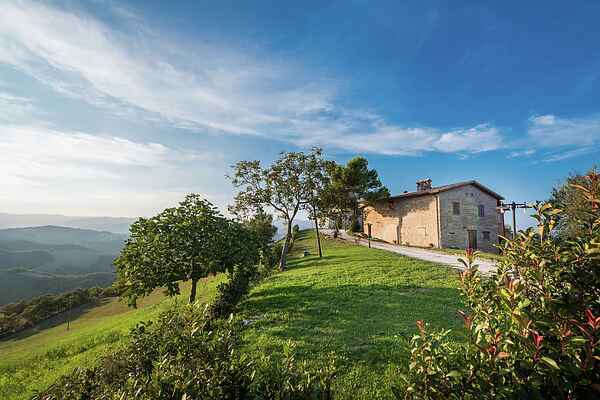 This hamlet with 5 apartments and a small swimming pool / jacuzzi is located in the middle of unspoiled nature and in a quiet area in the middle of the Apennines. The scenery is beautiful and the sunset is very special. The hamlet is at the end of a road on a hill and you have a spectacular view over the Metauro valley from the hamlet. In this hamlet once lived peasant families who worked the land. All apartments are fully restored. The original features including wooden ceiling beams and cotto tiles have been preserved. The apartments are tastefully decorated with a rustic and cozy atmosphere. 9 km away is located Sant'Angelo in Vado, a pretty medieval town where you can drink an aperitif in the square or a cappuccino at the bar. The area offers hiking, mountain biking or horseback riding and there are rivers to swim in and the beach is 1 hour away. There are many beautiful villages and to visit cities including Urbino.